Broker, Physical, or Trader - Who in the Bunker Industry Will Benefit the Most From 2020? Any readers who have attended a bunker conference in the last few years will no doubt have heard predictions that the 2014 collapse of OW Bunker would favour physical suppliers and brokers, to the detriment of the traditional bunker trading model, as buyers seek to shorten the supply chain. 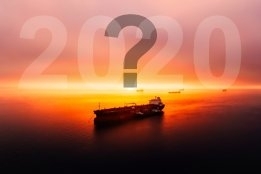 Then IMO's decision last year to implement a global 0.50 percent sulfur cap on marine fuel in 2020 means in just a few years time there will be a massive shift in the type of bunker fuel being burned by ships, which in turn has sparked talk of the Major's making a comeback. But if industry sources Ship & Bunker has spoken to are any indication, exactly who - brokers, traders, or physical - will benefit the most come 2020 is not as clear cut as it might seem. At first blush its been difficult times of late for traders; even some of the biggest industry names have been cutting staff amid evaporating margins and declining volumes, while the full year financials of those compelled to release them have made it perfectly clear why the cuts have had to be made. Add still, Adrian Tolson, senior partner at consultancy 2020 Marine Energy, says they need to do more. "There are still too many traders out there," he told Ship & Bunker. "The reality is that too many people still work in bunker trading and they are simply not productive enough. Traders can still - and do - make money, but costs have to be rationalized in terms of employees and offices." As far as costs are concerned, for supporting evidence readers need look no further than Bunker Holding - the world's second largest bunker company - who recently posted a 41 percent drop in annual pre-tax profits. And while Bunker Holding reported it had also "succeeded in substantially increasing" its market share, Tolson says it appears traders' volumes overall are still declining. "You can see it in the volumes reported by World Fuel Services, as well as anecdotally," he said. And while this is supposed to have made life easier for physical, that certainly does not seem to have been the experience of Aegean, the world's largest independent physical supplier: The 88 percent drop in net income reported in its 1Q 2017 financials precipitated a management clear-out that included its long-standing President, as well as its Chairman and largest shareholder. And the big comeback for brokers? "This could potentially be a good environment for brokers, but I don't see many people going down that route yet," Peter Grunwaldt, Senior Manager and bunker buyer at Hafnia Management told Ship & Bunker. So, perhaps the market conditions leading to 2020 will indeed play perfectly into the hands of the Majors? "Dealing with majors or global physical suppliers can have many benefits, but there are still some of them who need to prove they truly want to be direct with their clients," said Grunwaldt. So just who will we be buying bunkers from in 2020? LQM CEO Morten Eggert Troen is among those who see a growing role for brokers. "When you look at the market consolidation in the shipping industry that is taking place today, it makes sense that buying will come more in-house. But in 2020 you will need higher expertise in terms of product know how, where it's best sourced, the complete technical side of it," Troen told Ship & Bunker. "And of course shipping companies today want to be more efficient and direct, but there will always be these limitations in terms of knowledge. This is where we (LQM) can really make a difference, and as one of the world's best known bunker brokers, with a team of highly skilled experts, I can in fact confirm that we are also just as much of a data company in order to do reporting, benchmarking, and forecasts on prices for our clients. This is the direction we are going in as part of our aim to be a true value adding partner for the long-haul." Traders, meanwhile, have been streamlining and reinventing themselves to meet the new needs of both buyers and sellers, as well as the current market realities. at the end of the day, the physical suppliers could dictate how that scenery unfolds. Will they let the traders and brokers in, or will they increase their focus on the end user? "It is going to be more regulated in the future. Especially when it comes to compliance, if you don't have the right people and a system that can accommodate these issues then we don't think you're going to survive. Already buyers increasingly look to deal with knowledgeable counter parties such as Monjasa that can help them navigate these requirements," Monjasa Group COO Svend Stenberg Mølholt told Ship & Bunker. From the buyer's side, as far as Grunwaldt is concerned, traders, brokers, and physical could all have the opportunity to benefit from 2020. "Our preference is to go as direct as we can - where it makes sense. But we also have to ensure our counter party risk in minimised regardless of using traders or physical suppliers. The important parameters have not changed; we're looking for reliable, financially solid partners who have the skill sets to provide a top service, both operationally and financially e.g. optionality in contracts," he told Ship & Bunker. "And while we look to build relationships with physical suppliers, we also see some physical players wanting to continue to deal with traders for various reasons. But in the years ahead I'm sure we will see big changes on the 'Trading scene'. Companies will disappear, potentially through consolidation, and I think we will see a trend of traders going more and more physical - not only in niche markets. "Brokers today don't present a massive percentage of the market, but that could change. However, at the end of the day, the physical suppliers could dictate how that scenery unfolds. Will they let the traders and brokers in, or will they increase their focus on the end user?"